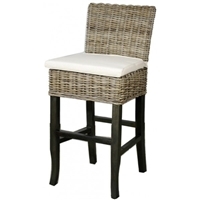 BERMUDA BAR STOOL.35" HEIGHT TO THE SEATING AREA. MATERIAL: RATTAN AND SOLID MAHOGANY. ALSO AVAILABLE IN COUNTER STOOL.